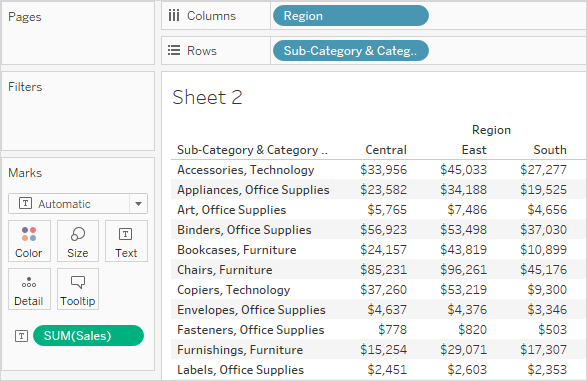 The Data pane has many features and functions to help you organize and customize your data fields, find fields, and hide fields. You can reorganize the items in the Data pane from its default layout using folders or through sorting. To make data sources with many fields easier to work with, you can organize the Data pane items into folders. Items like fields, parameters, and sets can be grouped into folders. 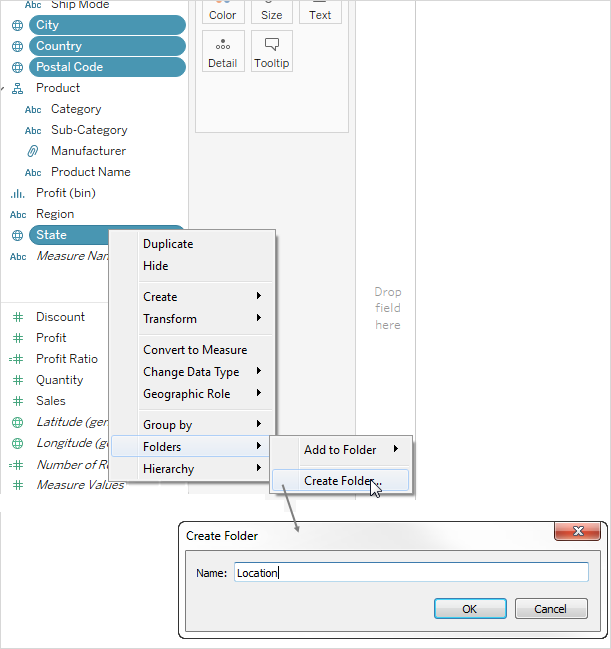 Click the Group by Folder option in the Data pane menu, or in a field's context menu. 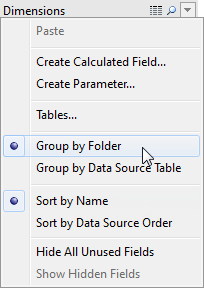 When you connect to a single table in your data source, grouping by folder is enabled by default. When you connect to a data source with multiple tables, grouping by table is enabled. When the Group by Data Source Table option is selected, the dimensions and measures are grouped according to the database table they belong to. This is especially useful when you have several joined tables. "Group by" options are only available for relational data sources—not for multidimensional (cube) data sources. In the Data pane, select the fields you want to group together or right-click (control-click on Mac) an empty area in the Data pane. Click Folders > Create Folder. 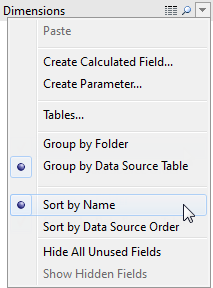 When organizing the Data pane with or without folders, you can have Tableau sort the items. These Sort by options are also located in the Data pane menu. Click the Find Field icon at the top of the Data pane (Ctrl + F in Windows, Command-F on a Mac) and enter the name of the item you want to search for. You can also enter a string of characters, to search for all item names that contain that string. As you type in the search box, search filters the contents of the Data pane to show all fields, folders or hierarchies that contain the typed string. Search remains open until you click the Find Field icon or press Ctrl + F again. You can rename fields in the Data pane. 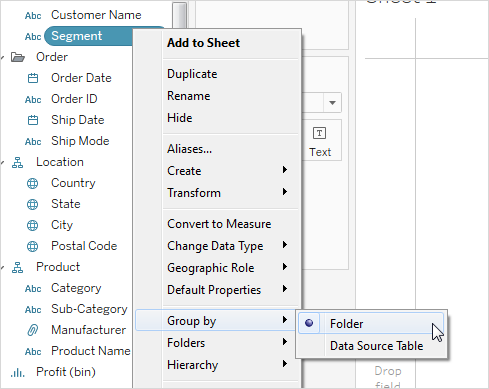 For example, you could rename a field named Customer Segment in the data source to be Business Segment in Tableau. You can also rename user-created fields. 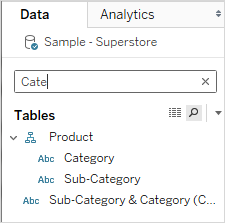 Renaming a field does not change the name of the field in the underlying data source, rather it is given a special name that appears only in Tableau workbooks. The changed field name is saved with the workbook as well as when you export the data source. You can rename any type of field: dimensions, measures, sets, or parameters. You can also press F2 or Ctrl + Enter to make the field name editable. Type the new name for the field and press Enter. The field displays with the new name in the Data pane. To revert the names of multiple fields that were in the original data source, select them all, right-click, and then choose Reset Names. Combine fields to create a cross product of members from different dimensions. You can combine dimensions if you want to encode a data view using multiple dimensions. To combine the fields, select multiple dimensions in the Data pane and then right-click (control-click on a Mac) the fields and select Create > Combined Field. Note: For cube (multidimensional) data sources, you must select levels from different hierarchies. In Tableau, cube data sources are supported only in Windows. For example, the selections shown below will produce a new field that consists of the Category and Sub-Category dimensions. The two dimensions are combined into a new dimension. The name of the field is automatically created from the names of the original fields. Right-click (control-click on a Mac) the new field and select Rename to change the name. When you use the new field in a view, a header is created for each combination of the two original dimensions. For example, the view below shows the members of the combined Category and Sub-Category fields. Note: For cube data sources, to choose to display the fully qualified name, right-click (control-click on a Mac) the combined field in the Data pane and select Qualify Member Names. You can selectively hide or show fields in the Data pane. To hide a field, right-click (control-click on a Mac) the field and select Hide. 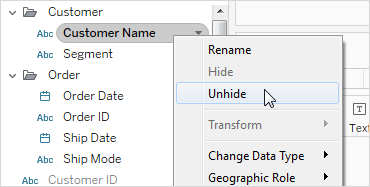 When you want to change your fields from hidden to visible, select Show Hidden Fields on the Data pane menu. The hidden fields are then shown in gray in the Data pane. You can then select one or more hidden fields, right-click (control-click on a Mac) and select Unhide. 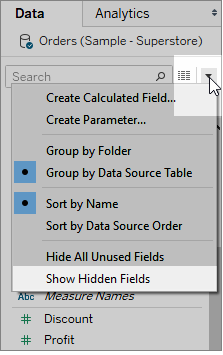 Select Hide All Unused Fields on the Data pane menu to quickly hide all of the fields that are not being used in the workbook. Note: Hiding fields can be a good way to decrease the size of a data extract file because hidden fields are automatically excluded from the extract. You can create calculated fields that appear in the Data pane. These new computed fields can be used like any other field. 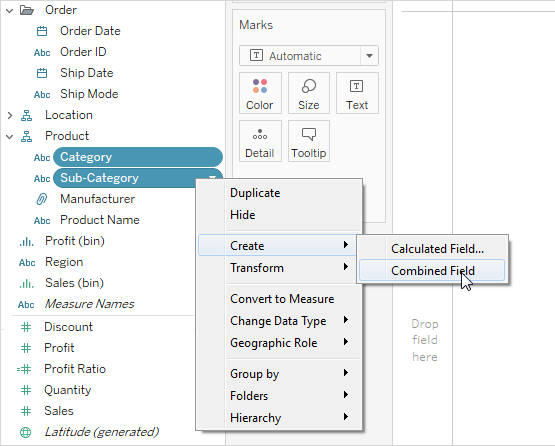 Select Create Calculated Field on the Data pane menu. Alternatively, select Analysis > Create Calculated Field.